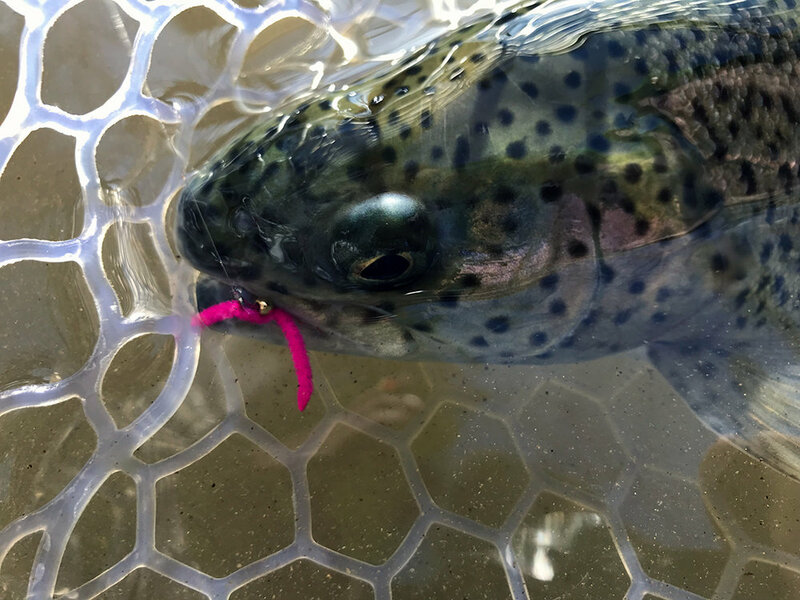 At times it’s nice to fly fish to large trout without having to think too much. When I feel this way, I typically head west to the Yellow Creek Trout Club (“YCTC”) in Indiana County, Pennsylvania. I try to get out to YCTC once a quarter and experience catching big trout throughout the different seasons. 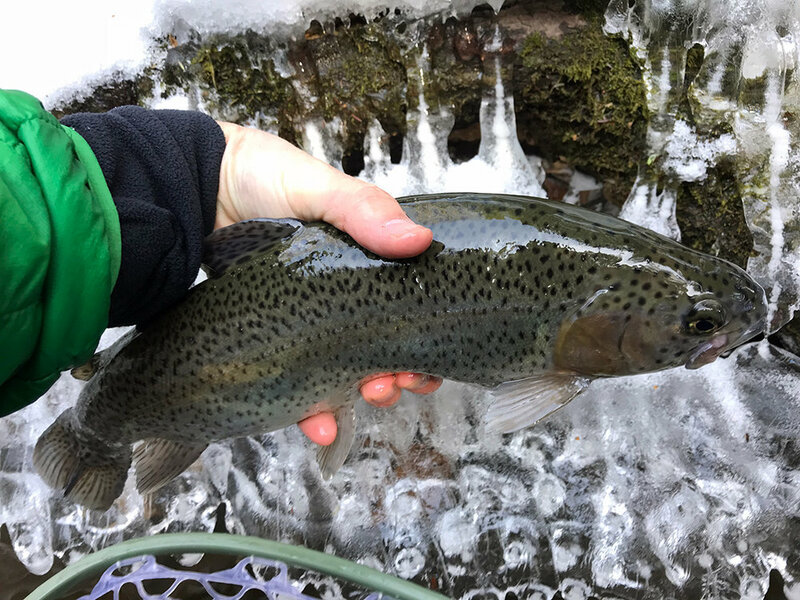 I never fished the club when there was snow on the ground and figured it would provide for a nice backdrop with temperatures forecasted to be in the 40s. I met the owner Steve at 7:00am on Saturday morning. The club road was slick but with four-wheel drive I was able to get down to the club pavilion without much issue. I was the first person in the lot. I walked over and took a look at Yellow Creek. Yellow Creek looking picturesque in the snow. The water flow was perfect, but the clarity wasn’t. The water was a murky green color. There were only a couple of inches of visibility and I knew the fishing was going to be tougher than I expected. I was glad I’d brought my box of steelhead flies because I knew I’d need some bright colors to cut through the murk. I pieced together my Scott 9’-5wt fly rod and tied on a 9’-5X fluorocarbon leader. I ran two feet of 5X tippet to a #18 Rainbow Warrior Nymph, and off the hook bend I tied a bright orange and yellow Y2K pattern with a gold bead head. My Y2K pattern is one of the brightest patterns in my fly box. After I was rigged up I headed down the footpath in the snow and made sure to open a couple of hand warmers. Once I arrived at the first fishing spot I pulled out my thermometer and took the water temperature, it was 34 degrees. I knew that before the sun hit the water, it was going to be difficult to move fish. After drifting my set-up for an hour through a hundred yard stretch that I knew held a lot of fish, I had no takes. I decide to move the Y2K pattern to the top position and tie a Squirmy Wormy off the hook. A few drifts later I hooked up with a nice rainbow trout that took the Y2K. 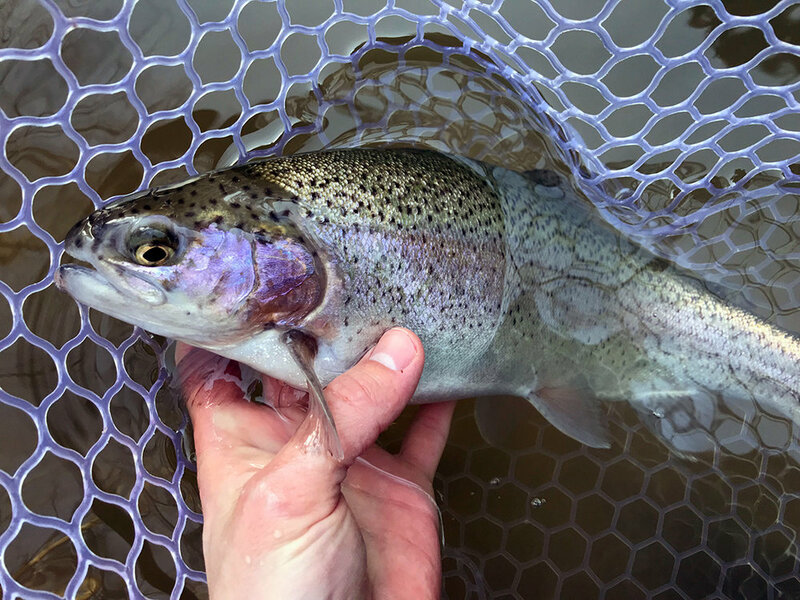 The first rainbow trout I caught on Saturday. 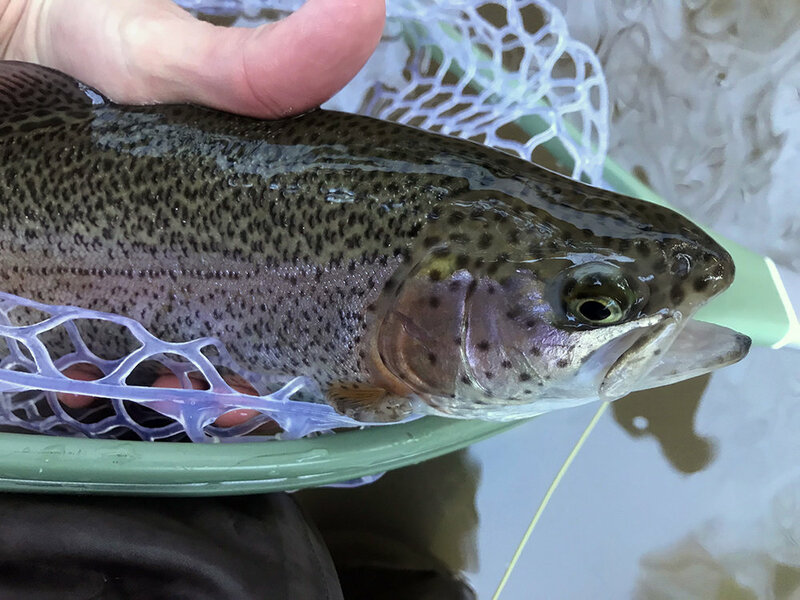 Several casts later, I hooked up with another solid rainbow. Their fight didn’t seem quite as voracious as you might expect with fish their size. After releasing a couple of trout and spending a solid two hours not catching anything, I decided to walk back to my truck to get my GoPro batteries that I’d left on the front seat of my truck. The second beautifully colored bow that I caught. After stopping at my truck I headed upstream to quieter waters since there were quite a few club members who’d shown up to fish the warming air temperatures. Heading upstream would prove to be a serious mistake. I walked across the stream and worked my way up the north bank. I came to an area I’d caught large fish before, and after two drifts I hooked up with a giant rainbow trout. This fish fought hard for five minutes and then I landed him in my net. A beautiful heavy fish. I caught one more trout in this spot before slowly working my way upstream. I got to a section where it looked to be an easy step down into the creek and as I took my first step I could feel myself losing my balance. I tried to catch myself on the bank, only to have my fishing boot slip on a rock. And in slow motion I dropped into the water sideways. I could feel 34-degree water rush into the upper part of my waders. I got back up as quickly as I could and then felt water trapped by my wading belt slowly makes its way down my legs to my feet. The section of Yellow Creek where I fell in. It wasn’t the worst fall I’ve ever had but it may have been the coldest. Everything was soaked, my shirt and jacket, my gloves, everything! I attempted to fish another 50 yards upstream and it just got too cold. I made my way back to the parking lot. I had one piece of dry clothing in my truck and I knew it wasn’t going to cut it in these temps. I grabbed my dry shirt and headed over to the pavilion where a member had a fire going. I hung my stuff and warmed up for bit realizing my day of fishing was most likely over. Sometimes fishing trips don’t go as expected, but that’s all part of the adventure. After trading some fishing stories with a couple of club members, I grabbed my still wet clothing, got to my truck, broke down my gear and headed out for a long, cold, wet drive home. What’s your best falling in the creek story? If you have a moment, share it below.